Osel Hita with Lama Zopa Rinpoche during the FPMT, Inc. board meeting, Aptos, California, USA, September 2012. Keep Up with Osel Hita! 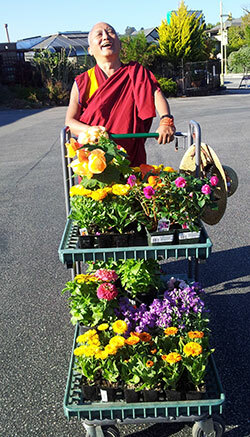 Lama Zopa Rinpoche shopping for offerings, Washington State, USA, September 2012. The annual long life puja offered on behalf of the centers, projects, services and students of the FPMT to our most kind and immeasurably precious Spiritual Director, Lama Zopa Rinpoche, source of our inspiration and guidance, will be offered at Kopan Monastery on December 29, 2012. The deadline for us to receive your donation if you would like your center/name to be included in the list of donors is December 18. The Light of the Path retreat with Rinpoche has been postponed from 2013 to May 11 – 25, 2014, as that date came out more beneficial. Lama Zopa Rinpoche at the Vajrasattva initiation at Vajrapani Institute, USA, October 2012. Lama Zopa Rinpoche’s live-streamed lam-rim teaching is now available to watch on the FPMT YouTube channel. These are practices which can be organized by the government of any country for the benefit of its people. These practices are not only to reduce the amount of murders in the country, but also to stop the dangers of fire, water, air, earthquakes, tsunamis, etc. The full advice can be found on fpmt.org. 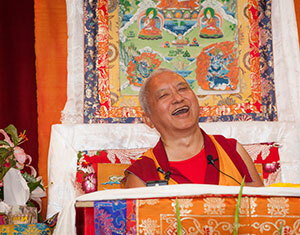 Find a broad range of advice from Lama Zopa Rinpoche on Rinpoche’s Advice page. 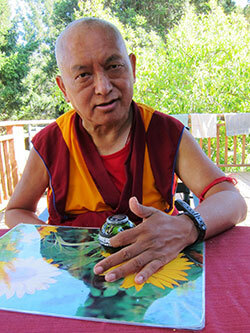 Go to the Lama Yeshe Wisdom Archive for lots more advice from Lama Zopa Rinpoche. Osel Hita at Istituto Lama Tzong Khapa, Italy, April 2012. We have created a new page with news and information on Osel Hita including interviews, photos, updates and links to Osel’s Facebook page and other resources. Learn more about the Osel Support Fund. Purifying the Cause of Samsara – Above the Door Mantras available as a hardcopy card, downloadable card, or a downloadable 24 inches x 8.7 inches (61 cm x 22 cm) poster. The Basic Program‘s most recent graduate, Ven. Gyalten Sangmo, received her completion certificate at Tse Chen Ling, USA from Geshe Ngawang Dakpa. 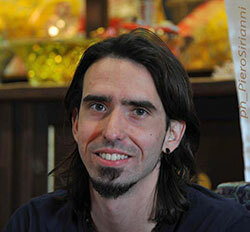 HEART SUTRA, the newest module for the Online Basic Program, is now available. This module is aimed at enabling students to acquire a thorough understanding of the meaning of this precious text and the different levels of meditation on emptiness taught by it. In this commentary offered to the five-year residential Basic Program at Nalanda Monastery, Geshe Sonam Ngodrub gives a detailed introduction to the modes of practice of the perfection of wisdom on the five Mahayana paths, as indicated by the Heart Sutra and its renowned mantra. The suggested amount of time needed to complete this subject is three months. You may purchase this online module via the FPMT Foundation Store, or access it on the FPMT Online Learning Center as a Friend of FPMT at the Dharma Supporter level or higher. You can always find fresh stories on Mandala‘s website. Our daily blog features news and updates from FPMT centers, projects and services in 37 countries worldwide and archive stories from Mandala going back as far as 1983. Stay up-to-date with the latest news, read excerpts from the long-awaited Lama Yeshe biography, Big Love; and get reports on Lama Zopa Rinpoche’s recent activities. Or if you rather, get our latest blog posts delivered by email by subscribing to our RSS feed. Lama Zopa Rinpoche playing with an exercise ball for the hand offered by a student, Aptos, California, USA, September 2012. Regionalization is the strategy being developed in order to fulfill Lama Zopa Rinpoche’s wishes for the FPMT. Our aim is to create a local tier of management at a national/regional level in order to support the current and ongoing growth of the organization as we work to fulfill Rinpoche’s vast visions now and in many future lifetimes. Read the full update, with associated background material on the new Regionalization Strategy page. Rinpoche has given extensive advice about the real meaning and significance of logos and how important the logo is to help the center, project or service have strength. 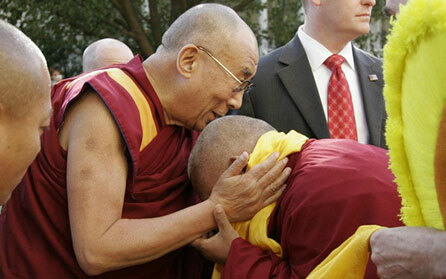 His Holiness the Dalai Lama being greeted by Lama Zopa Rinpoche as he arrives at Kurukulla Center, Medford, Mass., October 16, 2012. Lama Zopa Rinpoche was recently offered a large Medicine Buddha thangka from Mongolia, and it came out most beneficial in Rinpoche’s observation to offer it to Losang Dragpa Centre (LDC), Malaysia. 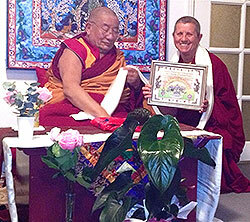 LDC unveiled the thangka as part of their 1,000 Offerings Event, with Khenrinpoche Geshe Chonyi presiding. 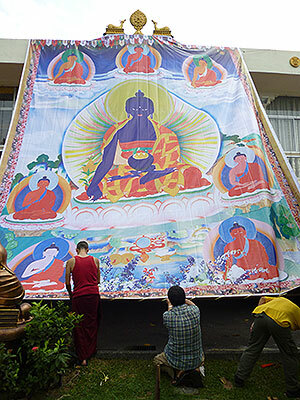 The thangka was carefully mounted from the rooftop of LDC and it ended barely two inches from the ground. A perfect fit. A fascinating interview with Osel on BBC Radio 4, a follow-up to an interview done while Osel was a teenager still studying in Sera Je Monastery. Milarepa Center, USA needs a spiritual program coordinator and an administrative manager; Mahamudra Centre, New Zealand is looking for a vegetarian cook, housekeeper and groundskeeper; Yiga Chodzin study group, Latvia is looking for a person, or a couple, to serve as housekeeper/manager and, if able, as handyman.